My partner and I have recently returned from two glorious, if a bit tiring, weeks in the UK. Most of our time was spent in London but we also took the train up north to Sheffield. Of course, I kept my eye out for fashion stories and over the next few weeks I’ll be sharing. Don’t you just love a man in a Chesterfield? One find was a dapper fella, Ken Goodwin. 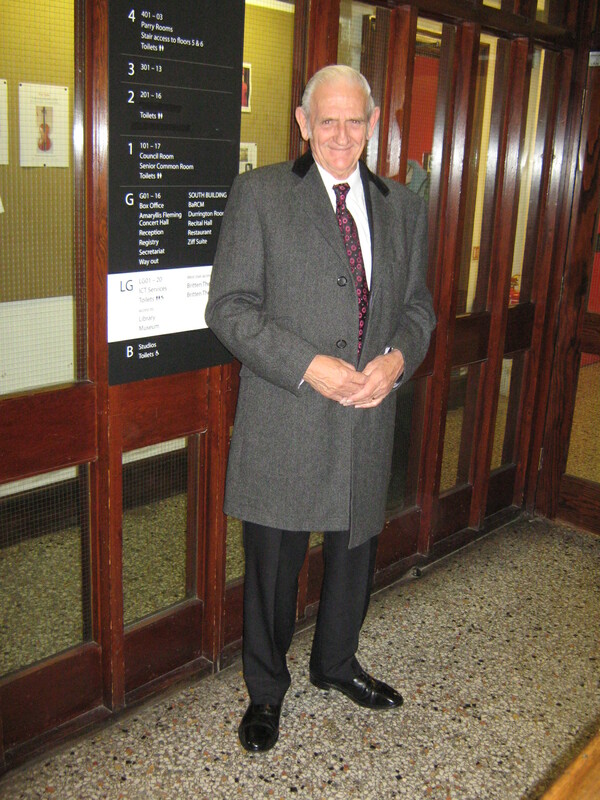 We crossed paths with Mr. Goodwin attending an afternoon concert at the Royal College of Music. I immediately noticed his Chesterfield coat as he sauntered into the small concert hall and took a seat. Chesterfields are among my faves and I rarely see them, even in London. Mr. Goodwin is a former airline employee and now retired he attends the RCM afternoon concerts every week, traveling by two buses from his home in St. Albans. In addition to music, Mr. Goodwin enjoys dancing and visiting his daughter in America. In fact, when we met him he was quite excited about an upcoming visit for Thanksgiving. Thank you Mr. Goodwin for stopping to chat with us. We wish you a very Happy Thanksgiving and keep up that fabulous dapper look you’ve got going.